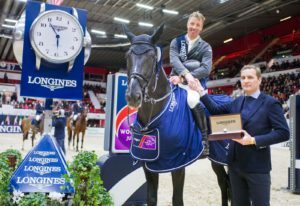 Less than two months left to one of the main sports events in Finland – The 34th Helsinki International Horse Show with the prestigious Longines FEI Jumping World Cup. The count-down from now on includes ultimate highlights like the WEG in Tryon and the Barcelona Final of the Longines Nations Cup. For the selected top riders the focus is at the World Championships. Only after WEG the indoor season enters the minds and plans of both riders and Chef d´Equipes. The Longines FEI World Cup Jumping season starts as usual with Oslo, followed by Helsinki. This ”Mini-Nordic Tour” attracts some of the best riders on the international circuit. It´s a perfect start to gain valuable World Cup points and 5* prize money too. The prize money in the World Cup Helsinki is raised to 186.000 € and the Saturday Land Rover Grand Prix to 103.000 €. 5* Helsinki has put lots of effort to up-grade the event. Thanks to the FEI Event Classification system, the event has been able to measure it´s efforts. Last year the Helsinki courses and fence material reached an incredible 99 % out of 100. Brasilian Guilherme Jorge´s course designing was praised by everyone. ”The horses love Gui´s courses”, as Meredith Michaels-Beerbaum put it. Two years ago the fibre sand scored 97 % out of 100, making it ”the best footing in the world” that season. International experts Oliver Hoberg and Karsten Koch make sure it´s top quality again. European Champion and rank 2 in the world, Peder Fredricson leads the top squad to Helsinki in October. On 25th September the top stars of Helsinki are published. The CSI5*-W Helsinki Horse Show runs from 17.-18. October (domestic) and 19.-21. October (international).